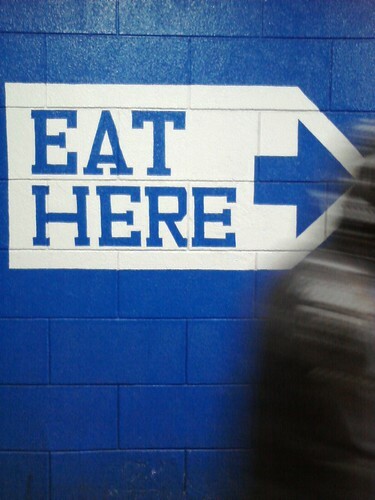 Eat Here, originally uploaded by Frankenstein. This week, it released the first of these reform ideas (PDF) focusing on the principle of fair use. In addition to "criticism" and "news reporting" and the rest of the items in the fair use preamble, the CRA proposes the addition of three more: "incidental uses, non-consumptive uses, and personal, non-commercial uses." They might sound minor, but these suggestions are bound to provoke controversy. What I find interesting is that this doesn't really address some of the key issues regarding the four factors, i.e. does a transformative use alone make it a fair use? Also, I would think that "incidental uses" would already be covered under the de minimus doctrine, and I don't think that it really falls under "fair use" properly. The second factor does sound like classic fair use. The third factor is, arguably, a huge expansion of fair use. Of course, this is highly unlikely to pass, at least in its current form, but I like it so far. Continue reading Copyright Reform Act tries fixing fair use with seven words. Hackers in Europe and China successfully broke into computers at nearly 2,500 companies and government agencies over the last 18 months in a coordinated global attack that exposed vast amounts of personal and corporate secrets to theft, according to a computer-security company that discovered the breach. … But data compiled by NetWitness, the closely held firm that discovered the breaches, showed that hackers gained access to a wide array of data at 2,411 companies, from credit-card transactions to intellectual property.